If the memory card in your Canon Rebel t5i contains scads of files, here’s a trick you’ll love: By using the Jump feature, you can rotate the Main dial to leapfrog through them rather than scrolling through them one by one to get to the file you want to see. You also can search for the first photo, movie, or video snapshot taken on a specific date, tell the camera to display only movies and video snapshots or only stills, or display images with a specific rating or stored in a certain folder. 1 Image: This option, in effect, disables jumping, restricting you to browsing pictures one at a time. So what’s the point? You can use this setting to scroll pictures using the Main dial instead of swiping across the touchscreen or pressing the right/left cross keys. 10 Images: Select this option to advance 10 images at a time. 100 Images: Select this option to advance 100 images at a time. Date: If your card contains files shot on different dates, you can jump between dates with this option. For example, if you’re looking at the first of 30 pictures taken on June 1, you can jump past all others from that day to the first file created on, say, June 5. Folder: If your memory card contains multiple folders — as it might if you create custom folders — this option jumps you from the current folder to the first photo in a different folder. Stills: This one is the opposite of the Movies option: Your movies and video snapshots are hidden when you jump through files. 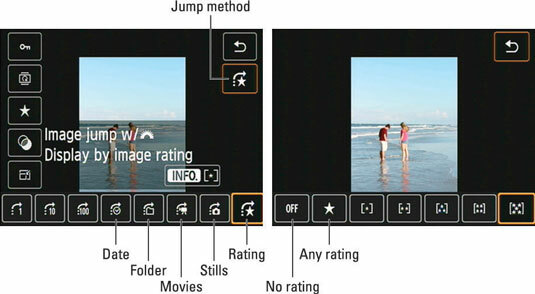 Image Rating: This Jump mode relates to the Rating feature. You can choose to view all rated photos, movies, or video snapshots; only those with a specific rating; or those without any rating at all. Quick Control screen: After displaying the Quick Control screen, select the Jump option. You see a row of icons across the bottom of the screen, each one representing a different jump method. Tap the method you want to use or use the left/right cross keys to highlight its icon. If you select the Rating mode, tap the Info icon or press the Info button. Then select the rating option that applies to the files you want to view when jumping. Again, you can choose files that have no rating; files that have any rating; or select a certain rating. Tap the return arrow or press the Menu button to exit the rating selection screen. To exit the Quick Control screen, tap the return arrow or press the Quick Control button again. 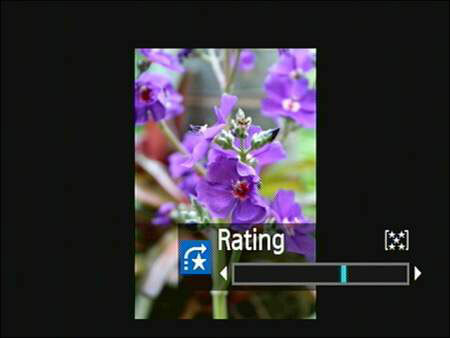 Playback Menu 2: Choose the Image Jump option, which presents the Jump settings. Tap your choice or highlight it by using the cross keys. If you choose the Rating option, rotate the Main dial to select the rating of the files you want to see. You also can tap the little arrows next to the selected rating symbol. After making your choice, tap Set or press the Set button. Press the Playback button to exit the menus and return to playback mode. Set the camera to display a single photo. You can use jumping only when viewing a single photo at a time. To leave Index mode, just press the Set button or tap the selected thumbnail. Rotate the Main dial or swipe two fingers across the screen. The camera jumps to the next image, movie, or video snapshot according to the jump method you selected. If you select any Jump setting except 1 Image, a jump bar appears for a few seconds at the bottom of the monitor, indicating the current Jump setting. For the Rating Jump mode, you also see the number of stars you specified. To exit Jump mode, just start scrolling through pictures using the cross keys or touchscreen. Now you’re back to regular Playback mode, in which each press of the right or left cross key or left/right swipe of the touchscreen advances to the next or previous picture.